Now this should be interesting: The Wrap is reporting that production company Escape Artists has hired legendary screenwriter Aaron Sorkin to pen a Lucille Ball biopic, with two-time Academy Award-winner Cate Blanchett set to star as the iconic I Love Lucy actress. The latter half of that equation is a match made in Hollywood heaven; Blanchett won her first Oscar for portraying silver screen legend Katharine Hepburn in Martin Scorsese's 2004 Howard Hughes biopic The Aviator. The ink is barely dry on this news and you can already hear Oscar prognosticators penciling in Blanchett for another little gold statue. But the Sorkin half of the equation is something of a head-scratcher. The man is undoubtedly brilliant, having written one of the most cherished television shows of our time and several Best Picture-nominated films. His mantle is already littered with Oscars, Golden Globes, and Emmys. 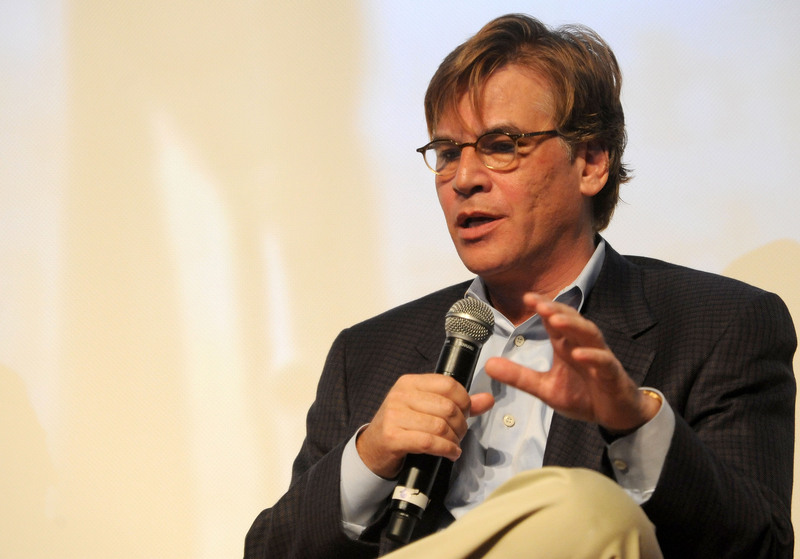 But in his 13-year career in Hollywood, Sorkin has never authored a single film or television series that revolves around a woman as its central character. On TV, he's more known for his fictional portrayals of idealistic male geniuses (President Bartlet on The West Wing, Will McAvoy on The Newsroom); in film, he's more known for his semi-historical portrayals of tortured male geniuses (Mark Zuckerberg in The Social Network, Steve Jobs in Steve Jobs). But even a male-dominated film/series can still contain compelling female characters. The West Wing gave us press secretary C.J. Cregg, a beloved character that earned actress Allison Janney four Emmy awards over the course of seven seasons. Unfortunately, C.J. has proven to be the exception to the rule when it comes to Sorkin's women. The criticism surrounding the writer's "woman problem" came to a head with HBO's The Newsroom, in which every female character was portrayed as clumsy, prone to tears, shrill, in awe of the men around them, or some combination thereof. Given that, the announcement that Sorkin will be writing a biopic about Lucille Ball — one of the most famous women in Hollywood history — can only feel like a direct reaction to those criticisms. But that's not necessarily a bad thing: if criticism led Sorkin to reexamine his career, identify a problem, and seek to correct it, that's an example of the system working. It may have taken him 13 years, but it seems as though Sorkin is finally listening to his detractors and making an effort to diversify his body of work. Perhaps if more people in Hollywood learned from their mistakes, we'd be seeing less violence against women onscreen and more diversity behind the scenes. Given that this film is being produced by Ball's two children, Lucy Arnaz, Jr. and Desi Arnaz, Jr., it's safe to say that the screen legend's life will be approached with care and respect. And if Sorkin can apply as much of his brilliance to a woman's life as he's done for men time after time, this biopic will be the must-see movie event of... whichever years it ends up coming out. In the meantime, we can enjoy Sorkin's whip-smart dialogue in the upcoming Steve Jobs, and Blanchett's incredible talent in the upcoming Carol, two films bound to vie against each other for Best Picture this coming Oscar season.